Over the past several months, there have been a near infinite amount of conversations about the continual existence of altcoins — especially as it relates to prices (i.e., rising tide lifts all boats). Some new preliminary research from Neil Gandal and Hanna Halaburda suggest that cryptocurrencies are not a winner-take-all scenario. It should be noted that their time scale and usage of a select few exchanges may not be adequate for generalizations yet but some food for thought. nd that early in the market as Bitcoin becomes more valuable (against the USD), other crypto-currencies become less valuable against Bitcoin. This trend is reversed in the later period. Some of the other crypto-currencies lost most or all of their value. On the other hand, the values of some of the successful currencies increased in price against the USD, and at the faster rate than Bitcoin. The data in the latter period are consistent with the use of crypto-currencies as financial assets (popularized by Bitcoin), and not consistent with \winner-take-all” dynamics. For exchanges, we found little if any evidence of arbitrage opportunities. With no arbitrage opportunities, it is possible for multiple exchanges to coexist in equilibrium despite two-sided network effects. After receiving some feedback on a variety of articles this past month it has been pretty sobering to realize that many Bitcoin advocates simply have no idea how the current economic system works, especially what credit is, where it comes from and how it functions. JL: I understand you have been in touch with Bitcoin industry members. What have those discussions been like? How do their approaches and strategies compare to yours or the NMTA’s? DL: Most Bitcoiners I have spoken to are not aware of their legal environment, or in a state of deep denial. It is not only about the federal and state legalities I mentioned above. They lack of awareness of the direct culpability society attaches to the Bitcoin dealer, if it later turns out that his Bitcoin customer dealt in drugs, terror, human smuggling, copyright infringement, hacking, or any type of criminal activity. How could you have known, you say? You are not responsible, you say? Well, it is your responsibility, they say, to develop a credible ‘Know-Your-Customer’ program, one that is ‘reasonably designed’ to prevent, detect and report illegal money that moves through, or is in any way facilitated by, your company. There are now at least 3 funded startups in the Bitcoin KYC space: Blockscore, Coin Validation and CoinTrust. It is pretty easy to find people who are strictly bullish or bearish on a particular asset or idea (or philosophy). It is another to find people who take the time to look at the details and also give of their time to help educate you. Over the last few weeks, I’ve had the fortunate chance to speak with a diverse group of experts, entrepreneurs and educated contrarians. And without their feedback, my thought processes and writings would be much weaker, poorly structured and lacking data. This is not to say I am correct in my analysis — perhaps just slightly less wrong! Below is a list of these individuals. I should point out that their inclusion does not mean they endorse my own views, in fact several strongly disagree. These are the people who are creating or trying to create the future in the roller coaster world. Similarly, because miners have to pay real costs – capital and operating costs – they too sell their mining rewards on the market: around 3,600 each day (because again, MV=MC). In my last article, I mentioned Total Volume Output – the total value of all transaction outputs per day – yet this includes coins which were returned to the sender as “change” and thus the real number trying to be measured is substantially less. And taken to its maximum readings, roughly 1,000,000 bitcoin outputs (UTXOs) are used each day. If only 10,000 – 15,000 bitcoins are being used in real commercial activities (instead of merely zero-sum activities like gambling, mixing of coins or cybercrime), then the perceived Total Volume Output is potentially two orders in magnitude larger than the real economy. What is the real economy? While the debate over what percentage of bitcoins are being spent in positive-sum activities, between October 15 and December 18 of last year, 41,928 bitcoins were sent to addresses controlled by Cryptolocker (a type of malware) – this is not real economic growth, in fact it is negative-sum. And because it signaled to the market that it was a successful way of generating (stealing) wealth, there are numerous copycats using similar methods (including CryptoDefense and Cryptolocker 2.0). For the moment, let us ignore the buy side of the equation, that in order to keep the same price level, at least 10,000 – 15,000 bitcoin are being acquired by other parties each day (primarily high-net worth individuals and institutions through OTC brokers). In practice however, most miners are operating at losses. In fact, the network is vastly oversecured by miners operating at losses probably by a factor of 2-5x (described in Estimated costs). For instance, according to a recent report from the National Science Foundation (NSF), a now-banned researcher used, “about $150,000 worth of NSF-supported computer use at the two universities to generate bitcoins worth about $8,000 to $10,000.” Or in other words, the researcher externalized the real costs of mining (energy and capital deprecation) onto another party (the NSF and therefore taxpayers). This is inefficient, yet there are many cases of such activity taking place each day. Thus while the Bitcoin ‘trust fund’ (a more accurate description for the network which divvies out a finite amount of block rewards) pays out security of $2 million each day, the labor force is providing significantly more security than they are being paid, probably closer to $6 – $10 million if not more (Hass McCook has additional estimates). Simultaneously, they are providing these services for commercial activity that ranges from as little as 5,000 bitcoins to perhaps as high as 15,000 bitcoins. Or $30 million to $90 million respectively in today’s prices. For comparison, MasterCard spent $299 million on their capital expenditures in 2013. As part of these expenses, it builds data centers similar to the “fortresses” (with moats) that Visa has also built. In 2013, MasterCard and Visa processed a combined $7.4 trillion in purchases. Together with American Express and Discover, these four companies generated $61.3 billion in revenue during the same period. If the labor force of bitcoin is spending $10 million on protecting the network yet real commerce is only $30 million, this would be equivalent to a mall issuing 1 out of 3 customers a personal security detail to go shopping. Or in other words it is, arguably, quantitatively oversecure (it is not qualitatively trustless as shown by GHash.io and previously, Deepbit). Perhaps this mix will change over time. However one thing to consider is that some bullish advocates contend that the Bitcoin network will one day supplant and compete head on with Paypal and even Visa. In order to do so, the Bitcoin labor force are still (assumedly) being paid a fixed income to provide the same services. Thus perhaps in the future, the opposite will occur – the network could become undersecure due to disproportional rewards. Thus, one take-away from this chart is that liquidity – as shown by the One Day, One Week and perhaps One Month bands – represents between 100,000 to 2,000,000 bitcoins. What is the actual number? Without a full traffic analysis we probably will never know. But we can tell from spikes that the largest movements take place during volatile time periods, specifically during price run-ups. So, for instance, in the spring of 2013 there was enormous Western media attention and a subsequent boom that peaked in mid-April (when Mt. Gox had to temporarily shut down). Similarly, in November and early December corresponds with additional global media coverage and Chinese adopters coming online – with prices peaking on December 4th. Or in other words, transactional volume rises and falls with price levels – that the bulk of on-chain activity corresponds primarily to day trading and speculation. This, despite the fact that Ratcliff notes, that prices during this 18 month time span increased 4,000%. Despite what some Bitcoin advocates claim, gold itself was not used on a large scale since time immemorial. In practice, there were numerous types of physical assets ranging from metals to stones. England even used a system of money known as tally sticks for several hundred years. And the reality is that prior to the birth of civilizations, many tribes and villages operated with barter and gift systems with themselves and one another (some never even created something akin to “money”). Thus, I would argue that ultimately Coinbase could turn into a fully-fledged bank, providing interest to bitcoin holders to be able to loan out bitcoins (much like BTCJam does). And they could do this through a fractional reserve process. In fact, Huobi’s new Hong Kong branch (BitVC) is heading in that direction; users can lend funds to Huobi for interest and Huobi will then lend it out to users to trade on margin. Contrary to what many Bitcoin adopters contend, fractional reserve banking itself is not inherently a bad thing but that is a topic for another article. Again, there is a difference between the economy Bob wants to have versus the economy Bob currently has. Today Bitcoin, as I have argued, is at most an emerging market akin to a pre-industrialized agrarian economy with enormous frictions. Internally it is an inflexible command economy that outsources and arbitrarily rations its scarce resources (block rewards) irrespective of economic conditions (e.g., Bob, the miner, is rewarded whether or not he processes transactions). Front loading rewards the first four years without processing any transactions is an unsustainable activity. In fact, as Jonathan Levin, co-founder of Coinometrics, notes in his upcoming paper, Creating a decentralised payment network, he found that “[i]n total over the network history there have been 84,469 blocks with no transactions.” Yet because there is no one at the helm, no entrepreneur to rationally allocate block rewards or market value for those rewards the first year, ultimately 4.2 million bitcoins were given out for naught. Many adopters note that this was done to help bootstrap the economy and that the initial distribution of bitcoins through the block reward is purportedly not how bitcoin will operate in the long run. And that at some point Bitcoin’s internal economy will somehow be incentivized by transaction fees only – or at least that is theoretical transition (see Reducing and removing block rewards). But the fact that miners were rewarded irrespective and arbitrarily of their actual work is very similar to how top-down command economies work rationing wages. This is a topic that will likely be debated over the coming years. The initial distribution of bitcoins is a one-time process that is distorting our understanding of the Bitcoin economy. 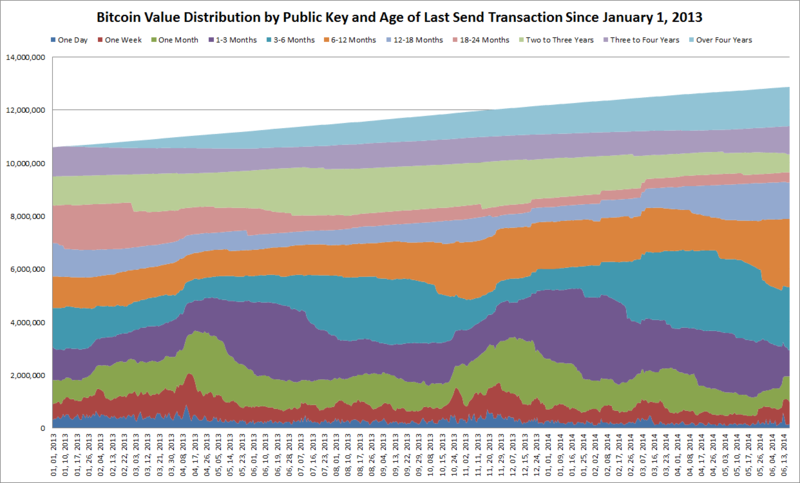 I think that the peaks in transaction volume during the price run-ups are a form of secondary distribution: early adopters are distributing their bitcoins, for profit, to new users. This is a vital part of Bitcoin’s distribution process and may continue for as long as there are periods of significant price increase. It may be that institutional investors will take-over a significant portion of this process for several years. Then, at some point, when the technology, infrastructure, regulatory frameworks, and our understanding of cryptocurrencies has matured, the price will stabilise and Bitcoin will return to individual users as a stable transactional currency in the traditional sense. Of course, I’m speculating wildly here. My point is that we don’t have a good null model. We’re not seeing “hockey stick growth” but maybe that’s okay. Many start-ups need this type of growth to survive — I don’t think Bitcoin does. During the Bitcoin crash of 2011 the price dropped 93% and didn’t recover until 2013. The difficulty also dropped and remained stagnant for a year and half. Although I can’t quantify it, the “mood” on the Bitcointalk forums was grim. The equivalent event would have been fatal to most start-ups. One of the common refrains about altcoins and appcoins in general is that none of the underlying systems are able to give out real equity and thus cannot have P/E expectations – neither does bitcoin, nor will it. This is a bug and it is why I argue that using the “TCP/IP” analogy is probably incorrect. The internet is an amalgam of private-public intranets cobbled together and cost real capital to build. It was not built with magic; real incentives had to be provided to build it. Imagine if those incentives decreased 50% every 4 years? That’s Bitcoin’s internal economy. The Bitcoin network cannot operate without bitcoins – the app or currency or commodity (choose your definition). The two are united together. Yet TCP/IP, the protocol, can still work even if substantial portions of the network fail; it is not tied to a specific set of hardware or token (TCPIPCoin). So what kind of bubble is bitcoin then? Some claim that it “crashes upwards” which makes no rational sense at all. Bitcoin (the token) is not immune to the laws of economics. 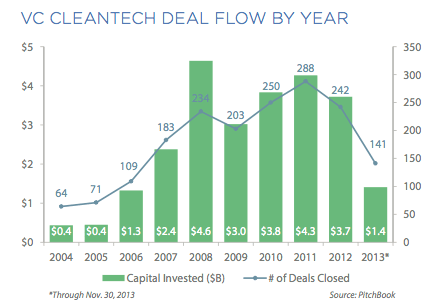 Perhaps as illustrated above (source), the current investment cycle in Bitcoin is more akin to Cleantech circa 2005? What this means is that, as noted in my previous article, even though many of the startups are clever, they may lack sustainable business models. Once this froth is removed, the businesses that survive will likely be those that are actually creating real pain killers (utility) to real needs; perhaps reusing the infrastructure of the network (like merged mining proposed by Blockstream or that of Cryptowerks) to process contracts and titles. Again, all of this is speculative, yet it warrants attention because Cleantech also had a similar dedicated ideological group of early adopters that created economic activity (though, not much growth yet) and wanted to change the world. And despite their best efforts it popped. In conclusion, expanding credit alone is not the answer to Bitcoin’s stagnant economy. For instance, China’s money supply grew leaps and bounds since November 2008 (when it implemented a series of stimulus packages). It also signed bilateral currency agreements with new countries every year which led many outside commentators to erroneously conclude that this somehow leads to mass adoption of the RMB. Yet the stark reality is that the RMB only accounts for 1.4% of global payments compared with the dollar at 42.5%. This is unlikely to change either. However, even in its current doldrums, the Chinese economy still produces real goods and services to the tune of trillions of dollars per annum. Obviously it is unfair to compare Bitcoin, a five-and-a-half-year old “startup” to China. Yet the emerging market aspect, the reuse of capital stock, the implementation of new financial instruments, the training of unskilled laborers and ultimately the creation of needed utility to outside parties can be viewed as facsimiles to learn and grow from. As noted by John Kenneth Galbraith in the last article, there is only so much capital that can be extracted from the “fleece-me” crowds of reddit. Significantly more capital is needed to scale operations to enterprise-level reliability. While some advocates believe eschewing the ancien regime of venture funds and private equity is the way to move forward, this is short-sighted. Below are some start-ups or at least young companies in this cryptocurrency space that are trying to move beyond primary exchange functionality (simple order books) and/or hosted wallet services. Note: this is not an endorsement of them as an investment or service. I have a new article that went up over at Let’s Talk Bitcoin yesterday called, Can Bitcoin change from a bubble economy into a growth economy? (pdf). It is essentially part 2 to the previous piece and put together based on feedback I received this past week. I should mention that while I did use an equation in the middle of the article to describe prices, I do not think the regression itself is valid. As my friend RD mentioned, the error term does not seem random. There is a deterministic trend that would have to be filtered out first. It is the same problem with modeling long term GDP growth. After all, why would we need all these economic models if we can simply draw a straight line and predict GDP using high school math? Many things follow an exponential growth curve, that is nothing new. The exciting thing is to forecast it in the short term, which this method is extremely bad at (the same criticism can be lobbed at models like Elliot wave theory). Over the last 12 hours I have received some criticism about one particular point: zero-sum games and gambling. Gambling in and of itself does not create productivity, but the businesses that surround gambling certainly can. See: casinos, bitcoin mixing services. Also, if the house makes a bunch of money, and the owning entrepreneur uses those funds to start another, productive business, then in some sense the gambling has facilitated economic development by liberating wealth from unproductive suckers who participate in online gambling to a highly productive entrepreneur. This was, of course, exactly the case with the most popular bitcoin gambling website. The issue here is a measurable one. A zero-sum game is one in which wealth is merely redistributed and not grown. What Bob described above is economic activity but not economic growth. Gambling is zero-sum game as is speculating on stocks or cryptocoins, no new utility itself is created. Tokens are simply being moved from person to person. Eventually many people are left with assets that they cannot sell because all the demand has been fulfilled, and at that point the price may actually crash. In other words, to make money in a zero-sum game, it is only because others have lost an equal amount. In fact, in many cases, value diminishes because of interchange fees or in the case of mixing services, transaction fees. This touches on an economic principle of opportunity costs (the “seen” and “unseen”) — the traditional example used is Alice throwing a brick through a shop keepers window. While the seen result is a repairman being hired to fix the window, thus spurring economic activity, this does not actually create economic growth because the shop keeper must now forgo certain opportunities to spend repairing existing physical stock. For players, gambling, at best, is a zero-sum game, i.e., the aggregate wealth of the players will not be altered due to a gambling activity. The losses of one party are precisely equal to the gains of the other participants. 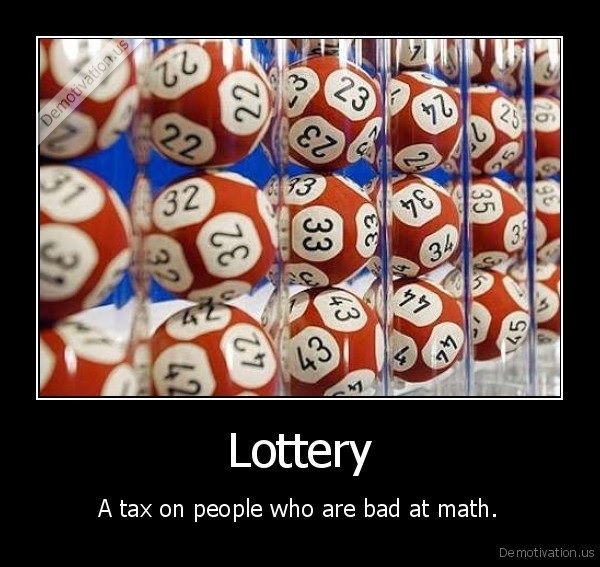 Of course, if the gambling activity were taxed by the government, or there were other ‘leakages,’ then the expected value of winning would be negative, i.e., the aggregate wealth of the players after the play would not be equal to their original wealth. Although gambling is a sterile transfer of money or goods among individuals creating no new money or goods, it nevertheless consumes the players’ time and resources and may subtract from the national income. From a macro-economic point of view, the aggregate wealth of the players will change, in the long run, due to the fact that the transfer of wealth is usually among unequal productive sources. It may be argued that the productivity lost due to a transfer of money from one player will be offset by an increase in the productivity of the other player. This assumption is true only if both the winners’ and losers’ production schedules were assumed to be identical and linear. One last note: there are a number of people I would like to thank for their comments included in this article; this does not mean they agree with or endorse my view. This includes: Dave Babbitt, RD, Mark DeWeaver, Dave Hudson, JL, Taariq Lewis, CK, Petri Kajander and Chris Turlica. If a 51% can occur, all trust in bitcoin should be lost forever. An investment that relies on people begging random strangers on reddit not to ruin it every couple of weeks is not really something that seems like a great thing to pour actual money into, tbqh. Tbqh means “to be quite honest” (that same user made other good points about this issue too). And here is also another interesting subthread (mulligan for that decentralization + neutrality notion…). Ghash.io is the largest mining pool on the Bitcoin network (it actually supports merged mining for Devcoin, Namecoin and Ixcoin as well) and it hit 48% of the network hashrate this past weekend (it is now 43%, see this chart). Its parent operating company is Cex.io and the system is run in a cloudhashing manner — customers rent hashrate by purchasing contracts with bitcoin. Interestingly enough, the cost of these contracts is now more than what you receive as a reward for hashing, leading to the joke that Ghash (and other such services) are pay-for faucets. That is to say, faucets are way to distribute tokens, for free (usually by filling out some Captcha once a day). Yet in this case, because of bitcoin volatility the past 5 months, users are actually paying to receive a minute amount of bitcoins — they might as well terminate their contracts and buy bitcoins on the open market. 1) As we approach the top of the S-curve in ASIC tech improvements, mining farms (and pools) will gravitate to locations with the best and cheapest network and energy infrastructure. This itself creates centralization risks that I and many others have written about. If you are renting out equipment (hashing systems) from a cloud provider at one of these locations, you can no longer physically move the equipment to another farm and perhaps in some cases, you may not be able to direct your miner to other farms (there is one proposal by Greg Maxwell that hasn’t been reported on involving tamper resistant private keys physically built into the gear, but that’s a story for another post). 2) Block size increases. In order to make the Bitcoin network more competitive as a payments and transportation network, there have been many proposals to increase the hard cap of 1 MB block sizes by several orders of magnitude. To date however, the average block size is around 350 KB, with an average of 0.7 transactions per second — thus the need to increase it is low (primarily because few people actually use the chain for much activity such as commerce). If block sizes are increased, without the use of something like tree chains, then centralization will occur because miners (and fully validating nodes) will need to pay for larger bandwidth options, larger hard drives, etc. which squeezes out marginal players. This is a known issue but Peter Todd highlights this as a hurdle for hashers wanting to move to another pool for the same reasons mentioned in point #1. And again, I’m not anti-Bitcoin, but a lot of the “facts” that some advocates say about how many bitcoin users there are — most of which are widely exaggerated — and this will not help data-driven companies who are on the fence of adopting the protocol. At some point these same companies will figure out that adoption rates are actually relatively low, so might as well be upfront about it. In addition, I think many of these challenges are surmountable, especially the technical ones. Lastly, I like the tech, I still go to meet-ups and start-up presentations on a weekly basis to meet more in this space too. And, I could also be incorrect. I was going to tweet but I chose to go private. I had to stop listening to the show because I just couldnt believe the nonesense that was coming out of your mouth. I was cringing because I know you are actually very intelligent. You sounded like a daft fundamentalist politician from the deep south. You make sweeping value judgements, logical fallacies and aspersions. If you continue on like this, no-one will take you seriously. I’m frankly stunned – you know what it sounded like? Like someone arguing the earth is flat and that the sun revolves the earth. I’m going to promptly forget I ever listened to that because I usually find your writings intelligent and well thought out. It is fine to disagree with me, in fact, my skeptical views are held by a mere a small minority. However, the blockchain is public and the data reinforces all of the claims in the interview which I later in A Marginal Economy versus a Growth Economy. And in terms of what Bob is looking for — someone to confirm his Bitcoin-to-the-moon views — this just creates an echo chamber, a confirmation bias that happens a lot in ideologically driven organizations. This technology is open-sourced and institutions will likely just cobble together the parts that provide utility to them and not drink the kool-aid, just as they did with the F/OSS community in the mid to late 90s. The past year has seen what some the “Cambrian explosion” in altcoins. Most are complete pump-and-dump scams. Others experimentally toy with a couple variables and a remote few actually bring something genuinely new to the scene (like proof-of-transaction in Fluttercoin). Wouldn’t it be neat to see a list of all the known altcoins and a little bit about what they were before they became ledger rot? For the last couple of months Ray Dillinger on Bitcoin Talk has been attempting to chronicle this digital death in: Necronomicon thread: Altcoins which are dead. I wonder who holds the record for creating the most alts? Is that something you brag about at a bar? Alts have a plethora of different hashing algorithms, but there are really only three divisions that matter between their proof of work. Either they are CPU dominated, GPU dominated, or they are mined with a particular kind of algorithm-specific ASIC. ASICs exist for SHA256D coins like bitcoin and for Scrypt coins like Litecoin. No other algorithm-specific hardware exists, so no other difference in hashing algorithm matters. Within each division, coins rapidly reach an equilibrium where whichever hardware generates their proof of work is allocated in direct proportion to the financial reward per minute of the block reward. Usually this means that halving the block reward of an alt, other things being equal, halves the hashing power securing its block chain. Most alts become unstable when 3/4 or more of their coin supply has been mined (second reward halving), even if no other factors have made the cryptocurrency unstable prior to that time. If the value being secured exceeds the block reward by too great a fraction, 51% attacks and forks are to be expected. 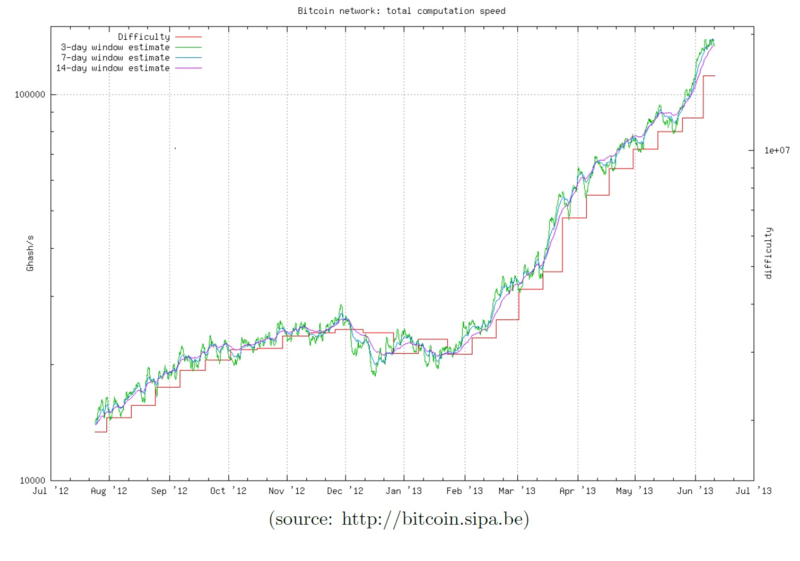 “Burst mining” or “automatically switching multipools” act like positive feedback amplifiers with a delay loop in mining – they make it VERY difficult for an alt to maintain a ‘stable’ block rate when its hash rate gets too small relative to the pool (GPU, CPU, or specific ASIC type) of hashing power it belongs to. This is a heavy contributing factor in the 51% attacks and forks mentioned above. Several alts switched to proof-of-stake after to this instability led to bad forks or “stuck” block chains where miners essentially had given up due to a burst miner leaving the chain at a ridiculously high difficulty level. A shift from proof-of-work to to proof-of-stake, whatever its effect on market value, has usually led to stagnation or decline in the community surrounding the alt. In turn this usually leads to a collapse in value of the alt, unless heroic measures (such as direct giveaways by stakeholders to non-stakeholders) are used to bring people into the community. I mentioned BitFury in passing in my lengthy piece on energy arbitrage. Last week they announced that they had received $20 million in venture financing. But one story that has not been translated into English yet (here is the Finnish version) is that their facility in Finland is nearing completion. They are reusing an old steel mill on Kimito Island and are coming up with a way to increase the efficiency of the heat recovery process to surpass that of Google (which also has a data center in the area). And according to my friend who helped translate it for me, BitFury has a 20 MW power plant at that location and it’s almost entirely in use. And that is with a token below $1,000. What Dogecoin (of all cryptocurrencies) is highlighting is the huge importance of incentivizing the labor force to stay and continue providing security and utility. With each halvingday Doge has gone through, this has led an exodus of labor elsewhere, sometimes to competing chains like Litecoin. Again, a halving day is when the network informs the labor force that they are now receiving a 50% wage cut. One common refrain that some Bitcoin advocates have stated in the past is that Bitcoin does not have a similar incentives issue. As I have described in numerous articles and papers, this is false. What we see here is that some marginal miners that were previously hashing on the Bitcoin network left and began providing their labor on a competing network (Litecoin) that was temporarily more profitable to them (or at least, what they may have seen as future profitability relative to their costs). These were likely GPU-based miners as FPGAs were increasingly being acquired and used by larger Bitcoin mining farms. Remember, while there were some proprietary ASICs that were developed and used in this time frame, they were not available to the public at-large — the first ASICs that were sold to the public (from Avalon) did not come online till the end of January / beginning of February the following year. The chart below is a visual representation of this phenomenon. Will colored coin extensibility throw a wrench into the automated information security costs of Bitcoin? I think the economics of “mining” reveal a design flaw in proof-of-work cryptocurrencies. The idea that people can ‘farm’ the money supply by buying and powering hashing hardware guarantees that the difference between the amount of value produced and the amount of resources expended will approach zero. It’s something like a tautology, where people are spending money in an auction for the right to print money. Such an auction is more or less guaranteed to bring the costs of printing money right up to its value, which is an unnecessary (and unwanted) feature. Aside from externalities and subsidies in the markets for electrical power and waste heat making the auction unfair from the beginning, that simply is not a necessary feature of a currency. Certainly no government-issued fiat currency is so resource-intensive to supply. But that comes about mostly because the government can impose additional costs (such as jail time) on unauthorized printing which are not borne by those doing authorized printing. And that distinction between “authorized” and “unauthorized” is something that peer-to-peer and distributed systems don’t have access to. For more information on this issue I recommend interested readers visit a great post by Robert Sams, “The Marginal Cost of Cryptocurrency.” Earlier this month I wrote a detailed follow-up post that Sams also helped contribute to (especially the concluding remarks) which discusses some of the the issues that Bob mentioned in the above comment. I think in the long-run both Ray and Robert will likely be proven correct though there may be some interim solutions such as sidechains that delay or mitigate some of these problems.